-Oh, you’ll love Chicago- that’s what EVERYONE who’s ever been there told me. And so I did. It was different than I imagined it would be, but I still loved it. It’s such a charming place. Stockholm used to be my only No.1, but now I have two No.1. They’re very different, but both very beautiful and very charming. And windy. I had no idea that’s what they call Chicago, but I can see why. In Chicago, S.O.U.L. performed in Alexander Bell Elementary and Kelly High School. Except for in Chicago, we performed in Crystal Lake last week, and, well, Bloomington, Indiana, as well, because that was Sunday. But let’s focus on Illinois. So, yeah, that’s Monica. And, I already wrote that in some of the previous posts, but I know that people from outside of America, make fun of people in USA of how everything there is amazing and everyone is great and fabulous and everywhere is beautiful… (when I say ‘some people’ make fun, I think of myself and my friends. I know… I don’t do that anymore, because I’m in America, so I write all this so that when my friends would want to make fun of me, they can sure try, but it’s not going to be that funny because I made fun of myself first! Ha! Who’s making fun of me now?!) Well, anyway, sometimes, some places, some people and some events are beautiful, fabulous and amazing. And one of those people is Monica. -When we bought this house we knew it was too big. It was so big. It is big! But we said we would buy it, but we would always invite people to come and stay at our house. Of course, she said that in a more beautiful way, but… wow. That’s exactly what her family is doing, sharing all that they have. I didn’t do it for the remaining 15 sec because I fainted. Anyway, Monica and her family are truly amazing. I enjoyed spending time with them, esp during the potluck/ hootenanny event that we had on Friday. We were at Monica’s and there was A LOT of great musicians who played all night. When we were supposed to go home, everyone was like: yeah, yeah, of course… can we play just this one last piece? (And it was like that all 6 times. I mean, there was Walker, the professional 16 year old accompanist who could read without any problems all the scores I gave him, of course I wanted to play and sing with him! All 18 times in a row) Of course, quartet performed as well, and now it’s safe to say that Taiwanese song Dalubaling is our No. 1 song. I mean… who wouldn’t love a song about a lake and a girl who falls in love with a boy… But the boy is actually (wait for it) a snake?! I know I love it! -Wow, what a beautiful name! -Hey, I don’t know if you remember me! But we met a few years ago on this one party… anyway, I loved your name so much that I named my daughter like that! -Oh, really?! So, how does she like the name Rochelle? In Alexander Bell I met two wonderful teachers. One of themworks there and has hosted S.O.U.L. for many years, so she was very familiar with the project, as well as all of us (that awkward moment when people you just meet know all about you, because they read your bio. Then again, it’s very nice that they did, because it’s shows that they actually respect and show interest in what you do. Yet, it doesn’t mean it’s not awkward). Now, for real, she was so supportive and happy with us, it was a pleasure to perform for her and her students. Also, we got a great question that day. After we explained that each of the singers comes from a different country and a different continent (Uruguay, Taiwan, Nigeria and Croatia), and had time for questions, a boy asked: -so, are you all Japanese? That just might be it. Our lovely host families took us to the Wallnut Room, which is a super fancy restaurant at the top floor of Macy’s. I saw The Millennium Park, The Cloud Gate, all the tall buildings, The Borders, visited The Art Institute of Chicago, went to The Second City and Chicago Board of Trade, went to a concert of classical music at The Cultural Centre, had an impromptu performance at a music shop, because… when you’re in a music shop with your vocal quartet and touch all the instruments in there and blow all the flutes they have (don’t be perv), then you fell you owe a little concert to the people who didn’t kick you out of the store. 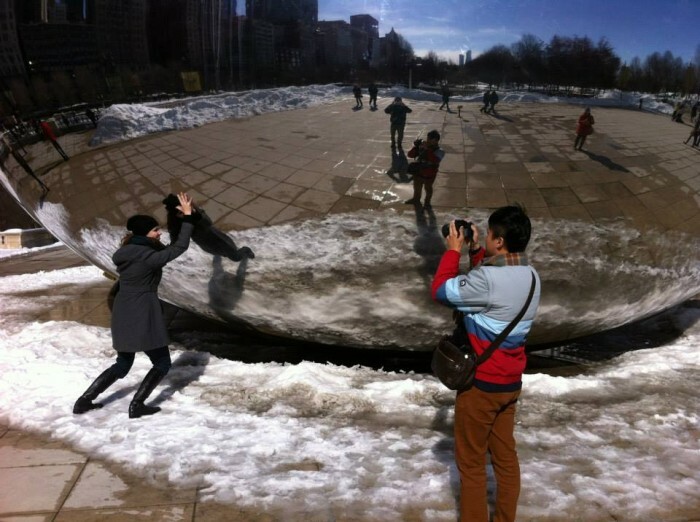 I tried really hard to export The Cloud Gate (BEAN) to Croatia. And then there was Crystal Lake. My host mom from Crystal Lake, Pat, sent me an e-mail before I arrived, asking what do I like to eat and do followed by ‘We would like you to feel at home for your short stay here’. Oh, and I did, I really did. It’s so important to have a nice place to stay when you do this job, and Pat as well as her husband Tom definitely provided me a fantastic home. The first night, Pat and I had a little jam session, since Pat is a guitar player. She went to get here songbooks and we just went with the flow! Tom was a patient audience. It wouldn’t surprise me if he would just become a patient afterwards, but thankfully, I think he survived it despite my singing. We had two concerts at McHenry County College, and, to be honest, I was surprised by the large number of people, (esp considering the fact that there was a (surprise surprise) snowstorm). And then, whenever there’s a snowstorm going on, people feel that special snowstorm connection, it’s like a strong snowstorm bond that unites everyone, therefore, we met some really nice people afterwards. Or maybe they were just nice because Shih-Hao said, when introducing the quartet, that we are 4 beautiful (instead of ‘professional’) singers. Which is not that obvious for most of the time. But when you let them know we are, they might as well believe that. And everyone likes beautiful people. Because they’re beautiful. Unless you hate them because they’re beautiful. “About 9 years ago I made a confession to my mom. It was very hard for me, but eventually I told her I would like to be a singer. She didn’t take it very well. Partially because she thought I might be mentally challenged and end up on the street because of my hopes and partially because she never heard me singing (although I don’t know why did she have to make such a big deal out of it. She heard me singing like 6 years later, so it’s not like I refused to sing in front of her all my life). Well, yesterday I’ve been to The Second City, which is a stand up comedy club in Chicago (in which Tina, The Great, Fey hit it off with her career) and I have another confession to make… and I know my mom would love it to be ‘I am a boy in a female’s body’… but, no, mom, I’m sorry… apart from being a singer (and a lawyer in my free time), I really want to be a comedian. I know this must come as a shock to you (if you spent the last ten years of my life raising someone else’s children), and I know I couldn’t have picked worse careers, but at least I promise not to be a beggar! Although that would probably at least make a living… well, maybe we’ll take that as an option, you know, just in case. And the last time I saw Tom, that day he took me to The Board of Trade, on Thursday, he told me (although he has said that to me before)- and if you ever need anything, don’t hesitate to ask. Remember, you’re family now. From now on, always. Of course, I cried like a baby after he left, ’cause there is no better place to cry like a baby then Downtown Chicago. It was just a part of my comedy routine… to see if people find seeing water drops falling down your face funny. I guess not, but, I’m a beginner, so… you know. Anyway, Illinois was amazing, and both Crystal Lake and Chicago, The Windy City, blew me away. Literally. What?! It was cold outside! A friend in need is a friend indeed.